The floating islands of Lake Titicaca in Peru are amazing! 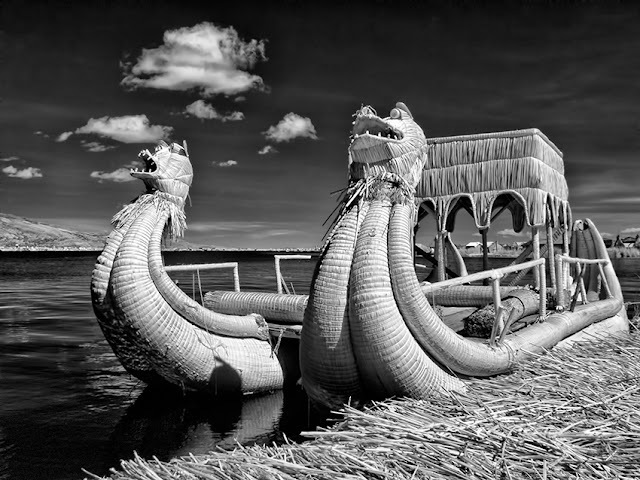 Constructed of reeds, these islands serve as home for the Uros, a small population outside of Puno. The reeds that make up the base are constantly replaced, and the spongy sensation of walking on the island is kind of like a waterbed! These boats were fascinating, and several of my Google+ friends mentioned a great book called Kon-Tiki written by Thor Heyerdahl about a 101 day journey from South America to the Polynesian Islands.